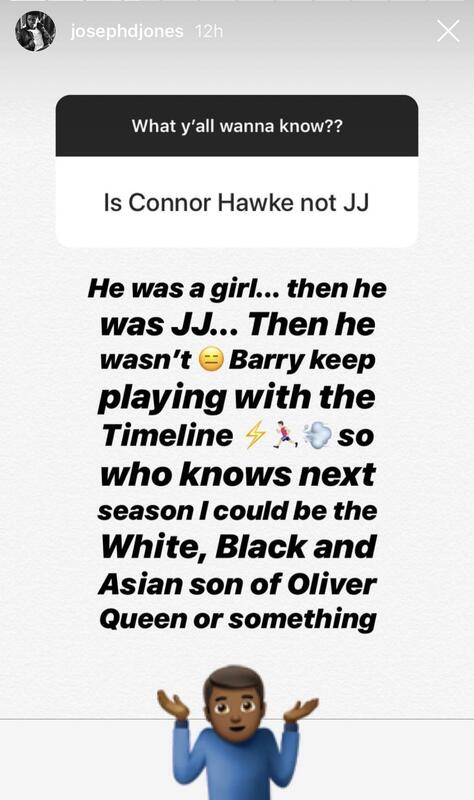 The new younger cast of Arrow are so hilarious and charming on social media. I cracked up so bad reading some of their tweets. Incidentally, I remember posting an audition video for Adrian Paul some months ago where it sounded like he was auditioning for the role of The Monitor. I also remember being surprised that he didn't get the part. So maybe TPTB decided that he was better suited for the role of Dante. Or maybe his audition sides were a misdirect and he was always intended to play Dante. Haven’t seen these here yet. If it was posted elsewhere I’ll delete. Or﻿ ﻿maybe his au﻿dition sides were a misdirect and he was always intended to play Dante. I like him better already. -No individual celebrity schedule posted yet. So it's his impression that he's suddenly not related by blood to Dyla because his skin tone is not light enough? At the very least I'm offended on the behalf of genetics. I'm adoring how chill and anti-egotistical Adrian Paul is. I already loved him from Hylander but after KA, AP is just like cool water in the desert. He's not wrong. I don't know what was going on with that hair in that first FF scene. Is this from the show or did he produce it himself? I don't recall that being on Arrow, so I believe it's a workout video that he did himself. TVLine is collecting cast reactions to the final season announcement. I thought Michelle Madison McLaughlin’s tweet was particularly interesting. I thought Michelle McLaughlin’s tweet was particularly interesting. Oooh I had no idea what you could be referring to until I read her post! From Emily's IG story. When she finally finds the words, I'm going to be a mess. She's coming for our lives, y'all. 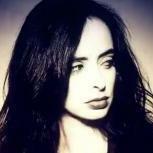 -- SA (tearfully): "It's been nearly seven years since we shot the pilot of Arrow and, um, just a few minutes ago, on the - well, just outside the stage where we actually shot most of the pilot where I came - my very first time coming to the production office - and, um - my God, where I met most of the crew, a lot of which were here today, on our camera test day, which is sort of our first day of school before we begin production. I just want to let everyone know that, after a 10-episode run - after a 10-episode run in Season 8, Arrow will be concluding. Um, I - I wanted to speak to the crew first because they're the most important part of the show without a doubt and they deserved to know the news. Um, but there are bunch of people for me to thank and just -just a few things for me to say. I just wanted everyone to know the story and wanted for it to come from me and wanted it to be in a non-parsed, uh, presentation, so to speak. Towards the end of Season 6, I approached Greg Berlanti, who I will be thanking in a second, and I said that I thought, both personally and professionally, that at the end of my commitment this season, it would be the best for me to move on. Um, I've always been a - I've always been a fan of television shows that not only don't overstay their welcome, but ended in a manner that really packs a punch. And so it has always been my hope that we would know when we were going to finish this journey and not limp to the finish line, so to speak. 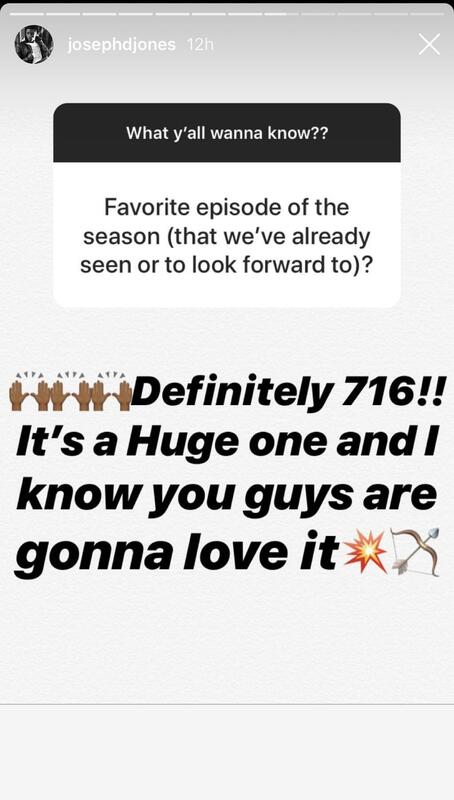 After a lot of discussion, Greg and I decided that the best way to do this would be to have me come back for a limited run in Season 8, which is what we're going to do, and, uh, from there, I had always hoped that beyond the 17 different shows that Arrow has spawned - I'm kidding, it's only like 16 - that there was a possibility that the show might live on beyond me, because the entity of Oliver Queen and the character and the mythos and the iconography of Green Arrow has always been something that's bigger than me or any other actor that's playing him or voicing him. There's always been something more to it. I spoke to Beth Schwartz and Marc Guggenheim this past Friday and Greg Berlanti this past Friday night. And it was the decision of The WB and CW and Beth and Greg and Marc in a very mutual way, um, based off of what they thought was best for the show creatively, and being very honorable and respectful as well as pertains to my wishes, that we were going to end after a 10-episode run next year. (Sighs) Even though I've known this was coming, it's still a very emotional time because I have been on the show in what can only be described as a fundamentally transformational, nearly decade-long run in my life. To start it as an actor who doesn't have a lot of experience, who is, you know, sort of dating someone, to now a large part of this decision being because I'm now a father and a husband, and a lot of my life and interests now don't really reside in Vancouver any more, and thinking that that's the best thing for me personally and professionally. To say it has been a real sea change over the past seven years would be a vast understatement. So I'd like to begin by thanking Greg Berlanti and all of the executives that have been involved in Arrow, beginning with Marc and Andrew, and extending it to Wendy and now with Beth, who has, uh, given this show a vibrancy and a life that I think is just so uncommon for something that's in its seventh season and drifting upwards of 160 episodes at this point. I can't thank all those partners enough. To all of our directors, principally along the way, David Nutter and Glen Winter and Wendy Mericle and James Bamford, who came on in Season 5 as a producing director and has been a steadying hand and has really given us just a lot of things that I think we never knew were missing until they were there. I'm not going to be able to thank everybody by name, but - and I'm going to forget people, so I'd like to apologize. At WB, Peter Roth has just shown such an amazing amount of - of faith in the show and that's been so - just so wonderful. At The CW, uh, Mark Pedowitz and Susan Gomez - Suzanne Gomez, who is not watching this because she is out of the office at the moment - she knows what I'm talking about - and Paul Hewitt. We had a dinner this past fall with - with Mark and Paul up in Vancouver because Mark Pedowitz makes a trip every year just to see how we're doing. And he had some of the most kind, lovely, thoughtful words to say, so I'm glad that I've been an ambassador for both WB and especially for the CW because, when we came aboard was when he came aboard. And to see the changes that the network has gone through has been really special. I'd like to thank Diane Nelson and Geoff Johns at DC for having the faith that we could be a good ambassador for one of their characters and then for having the faith that this show could help spawn much bigger characters, which was always such a joy for me that they had that sort of faith in us. I've already spoken about the crew and just - there's just too many people to name along the way. But for some of the people who were here during the pilot, you know who you are. And the first thing I said was, I wanted to finish this run with as many people who began it as possible, and I really do hope that that comes to pass. And then the cast - um, whether you came here at the beginning or you came here in Season 5 or 6 and fit in seamlessly, I've had the pleasure of working with so many wonderful actors, and so many actors that just surprised and delighted me by coming on the show and telling me that they were fans of what we did as a collective. I would like to thank my family, specifically my wife Cassandra and my daughter Maverick, for putting up with really stupid hours. And this feels strange because it is certainly not the end, but it is certainly the beginning of the end. And this show has given me a platform that extends so far beyond my ability to just appear on your television 23 times a year. It has given me a voice for philanthropic endeavors, for social issues that I'm interested in. I got to take batting practice with my favorite childhood sports team. (Laughs) Um, I've had cinematic opportunities that are a direct result of the work that I've been doing here. And, um - and I know when this is all said and done, after I drop off the face of the earth for approximately two months, probably like on a safari or something, I know that the next chapter for me both personally and professionally is going to be really exciting. Last but not least, to the people that are watching this right now, to the people that have populated my social media channels over the past seven plus years, I have made countless friends. I have been able to tell so many stories. I have been able to facilitate great moments for people because they're a fan of the Green Arrow. And I'll miss that a great deal. But something tells me, even when I'm done, I won't be gone. 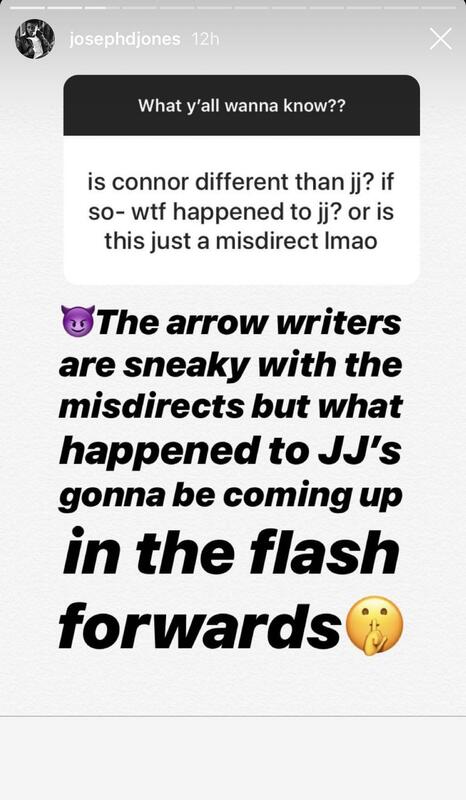 If you've watched the Arrowverse, you should understand that. Thank you very much, guys. There'll be more from me. I'm sure I'll get the chance to talk more about it, but I wanted you to hear about this from me. I think, um, I think it's been a good run. It's no Supernatural, but it's been a good run. Alright. (Blows hand kiss) Thank you. I love you all." Looking at Adrian Paul just drives home the point of how bad the old age makeup is on the show. People in their 50's and 60's look like him and Susanna Thompson and Paul Blackthorne and Teryl Rothery and John Barrowman. They don't look like 2040 Dinah or 2046 Oliver. I'm so thankful for Highlander. I can't image the final full season with Diaz as a big bad. Stephen Amell made me laugh twice in that video. Once when he said how long Supernatural has been around for. The other when he mentioned how vibrant Beth Schwartz has made this current season. Ironic when he seems like he can't be asked in most of his scenes. He came across well though. He seems incredibly grateful about what Arrow has done for him. Reading the transcript... it makes sense that SA wants to leave although I always thought he wanted to compete with Supernatural in a way. That said, I'm really curious about where the cast goes from here, particularly EBR. This seems odd... it feels like most of SA's interests include hanging out with friends (who seem to come from the cast, thinking about EBR)/his wine company/and his family. I know his family lives in LA, but it doesn't feel like SA has a lot of stuff going on otherwise, minus the cons and the wine? 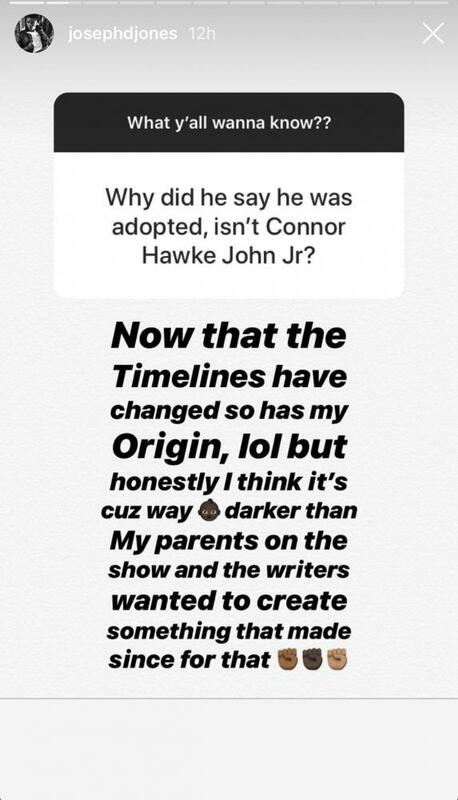 I guess this gives him the time and space to figure it out, but I'm curious because he seemed a lot more interested in doing other projects and capitalizing on his position early on in Arrow. His action movie career got derailed when the TMNT film he was in tanked beyond belief and his self funded projects have been iffy. His wine company seems more novelty than anything else. I thought for those reasons he would stay has long as possible but after the relentless pushing of NTA, introducing Emiko and the Legacy!FF kids the writing was on the wall. He comes across well in the video. Grateful but I think just DONE even if he doesn't have any (public) projects lined up. Think Smart, fight like crap, protect when i feel like it and be a Boss? This is the article from a few years ago. but THR is tweeting out the list in honor of International Women's Day. 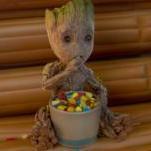 That's very sweet. Very focused on her emotions regarding the ending of this journey. They look like they're having a ton of fun. Candice looks like she's glowing - I like her outfit.